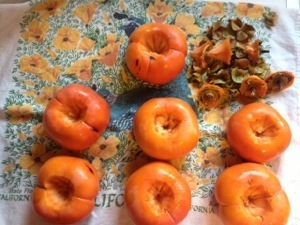 I have been overjoyed looking at all the persimmons we picked the other day. I have looked for persimmon recipes and honestly haven’t found very many that are gluten-free or interesting . 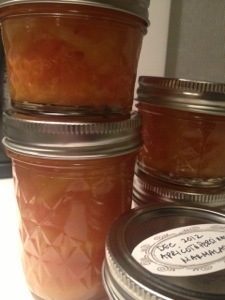 I did find however this recipe for persimmon apricot marmalade that turned out so good I made a second batch already. 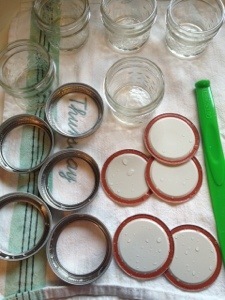 The jars will be going to my family for Xmas gifts. I made some adjustments to what I had on hand. I used juice from 2 limes, I added a dash of cinnamon and dropped in 3 cloves instead of using ground. 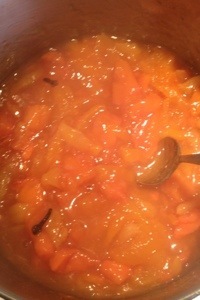 Before I canned the marmalade I removed the cloves. My husband had a leek and bacon scramble with Food for Life Raisin Pecan Toast and used an entire jar of Marmalade! Mmmmm….good! 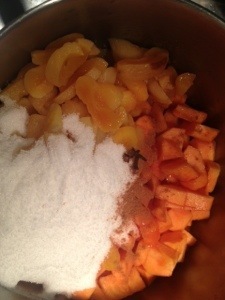 This entry was posted in Food and tagged apricot, canning, food, marmalade, persimmon on December 7, 2012 by amybailey aka knitsakes.